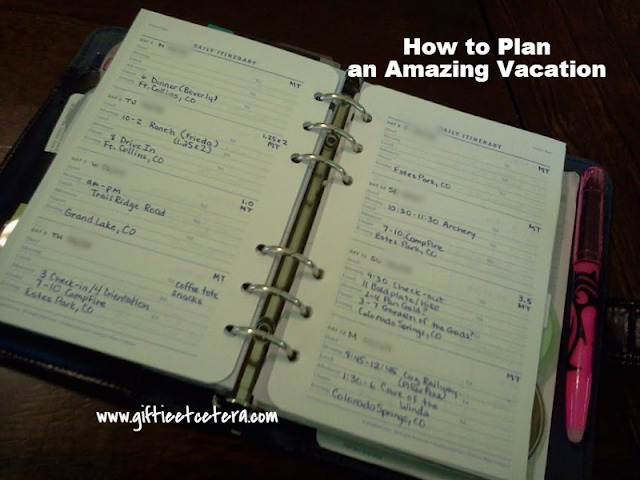 Planning summer vacation does not have to be overwhelming. Today, I'm giving you a peek at my vacation plan for this summer's road trip to Colorado. 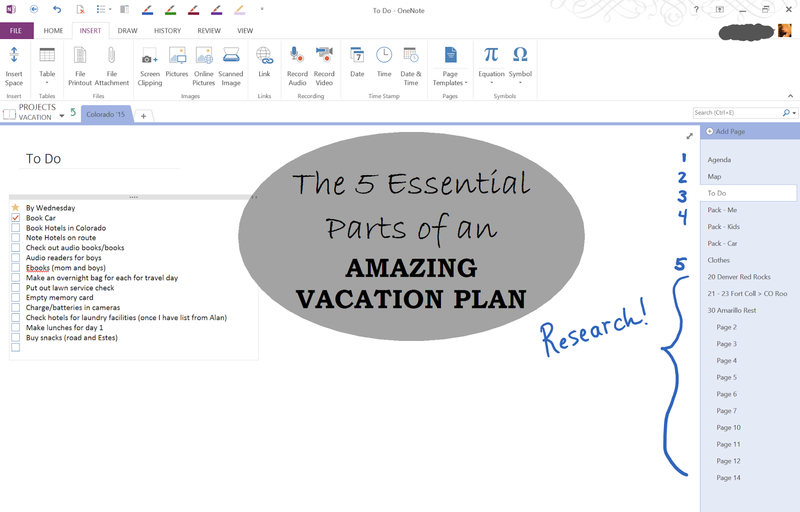 Just grab your planner, a notebook, or a program like OneNote, and set up the sections that make your vacation plan flawless. Most people just jot some dates on the calendar and make a quick packing list. For a smooth trip, though, I recommend more planning than just a packing list. Check out this picture for a peek at my plan in a OneNote notebook. There are five essential part of a successful vacation plan (numbered in the above picture) that will make your trip stress-free. I started the agenda on Google Calendar because I could share it with my husband. We tweaked it until it worked. Once it did, I backed it up by printing it to OneNote (because I use it as a reference when I create the other parts of my vacation plan) and used some Franklin Covey Compact "Summer Plans" sheets (in the very first picture on this post) to put a written agenda in my planner. Of course, you don't need special pages to do this planning. They just made it easier. *travel times (under time changes). Again, for reference only, I put a map in OneNote of our route. In the car, I will actually use a GPS and an old-school atlas (both for the kids to follow our progress on and for times when there is no satellite for the GPS). Having a map is an often skipped step, but a map of something has been essential for my last three vacations, so I broke down and added this section. For Disney World, we used a map of the parks to plan food and Fast Pass locations. On our cruise, a map of the ship helped us decide where to book, how long it would take to get the kids from Camp Carnival, and how to navigate from the dining room to the nearest frosty frozen drink area. With a road trip this time, there is no skipping the map. My Loyal Readers know that I usually like tasks right there on my weekly spread. But a list of things that need to be done before I leave for vacation is essential to getting ready to leave in time. TIP: Don't forget to check the memory card and batteries in the camera before you leave town. I make a different list for me, for the kids, and for putting stuff in the car. I divide my list by bag - electronics tote, snack tote, suitcase, overnight bag, etc. Note that multiple packing lists are important. If you just have one long list, it gets overwhelming. Clothes schedules are something else that I've adopted over the last couple of years. No one really thinks about a clothes calendar, but it helps when packing and it helps when on the trip. For example, when packing, I can note days when we will see other people, so I need to wear makeup and a bit of jewelry. On hiking day, I'll pack good shoes and old clothes. Then, while on the trip, I just look at the date and dress appropriately. This might seem silly, but this tool makes the trip so much easier. Since OneNote is such a good place to collect research, as I find websites with information about sites or restaurants, I print them to OneNote, right there in my vacation planner! I know some of these sections are unconventional, but time and time again, they've proven themselves essential parts of the vacation plan. Excellent vacation planning tips. I normally create lists and sometimes come up with agenda, but not that detailed. Something to think about the next time I want to pull my hair out planning a vacation. I do a whole travel booklet. It includes the clothes calendar so I can plan outfits by day, weather, and activity for our family of four, plus packing checklists, what to do each day a week before departure, notes pages (to take all kinds of notes including how to update my travel booklet for next time), and a paper folder on the inside (just turn down a corner on one page and tape it to the next page). I created the template in Mac pages so now all I have to do is print about 7 days before we travel. It makes getting ready to go much easier and far less frantic. Love your blog and tips. P.S. I'm a lawyer, too. Wow! That is organized! I'm impressed! Thank you so much for sharing your strategy with us at the Inspire Me Mondays Link-Up. Happy Travels!